It’s been a long time that I haven’t shared any recipes of Chicken curry. It’s not that I have stopped trying new chicken recipes these days. Almost on every weekend, I experiment with new kind of chicken preparation for our dinner. Since my family including my son is big fan of chicken dishes, most of the time it gets finished very fast and doesn’t have sufficient leftover that I can take good pictures. This week I planned it in advance and could take the pictures for the blog so that I can share a new recipe with you. The name Rezala wouldn’t sound new to you, if you are from Bengal. It’s very famous dish in Calcutta. I have seen many of friends talking fondly of weekend evenings spent in Shiraz with their signature Rezala. There are other restaurants in Calcutta like Nizam, Sabir’s, where this dish is the favorite for all food lovers. It’s commonly made with mutton but since Bengalis never stop experimenting with food, they came up with the same version of Chicken. I know many of my friends including my family don’t eat red meat. 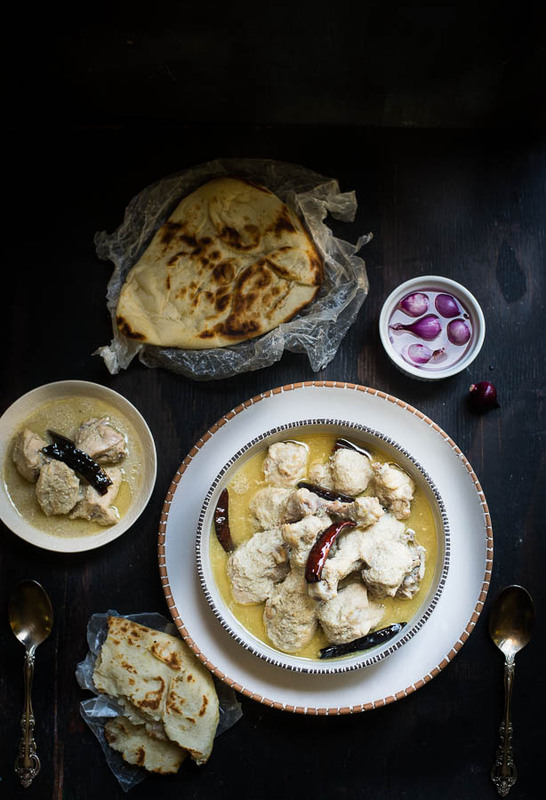 So today I am going to share the recipe of Chicken Rezala. 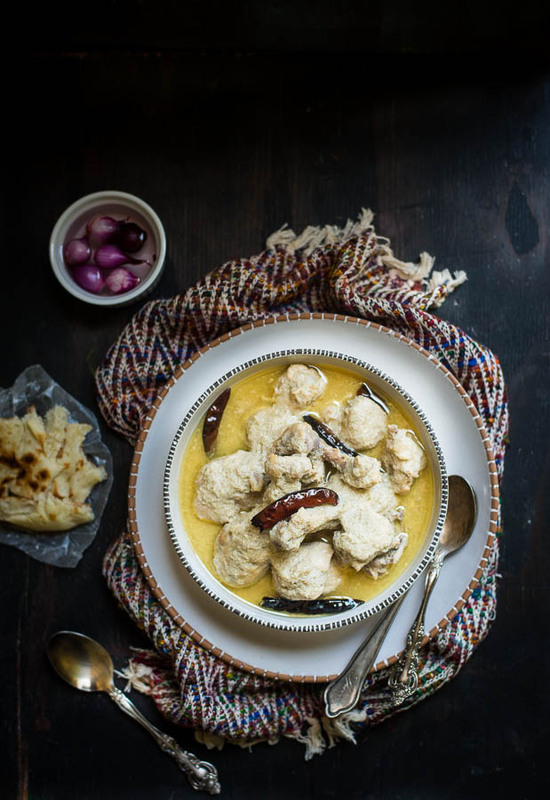 Chicken Rezala is a thick and mildly spiced Chicken Curry. The gravy is slightly thicker than stew and based off yogurt. The white gravy is made with cashew nuts, paste of poppy seeds and curd. 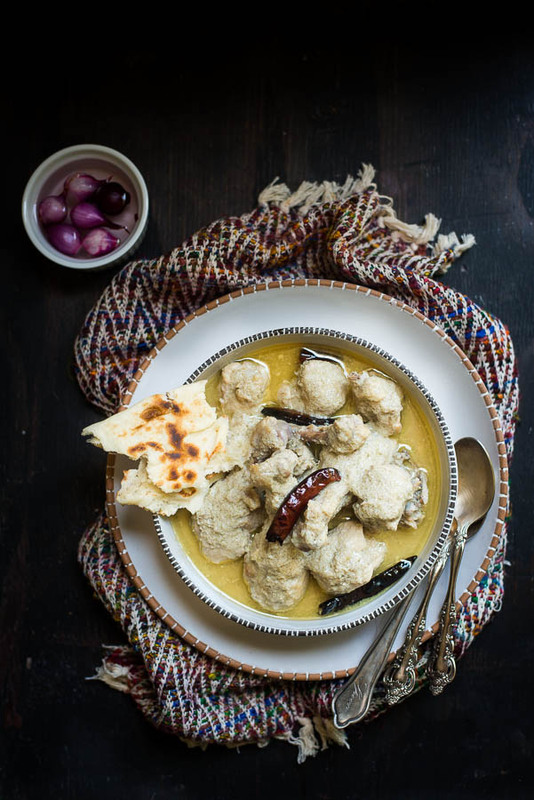 The chicken is cooked in this gravy with a blend of aromatic spices like Cardamom, Cinnamon and Cloves. 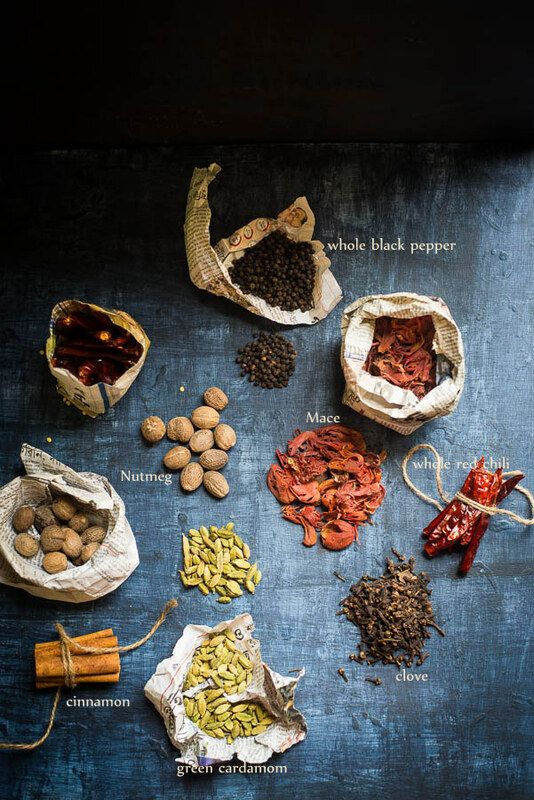 It also uses subtle spices like white pepper powder (Shah Morich) and rose water. Use of these subtle spices makes the taste and flavor of this dish very different from other Mughlai preparations and makes it royal. 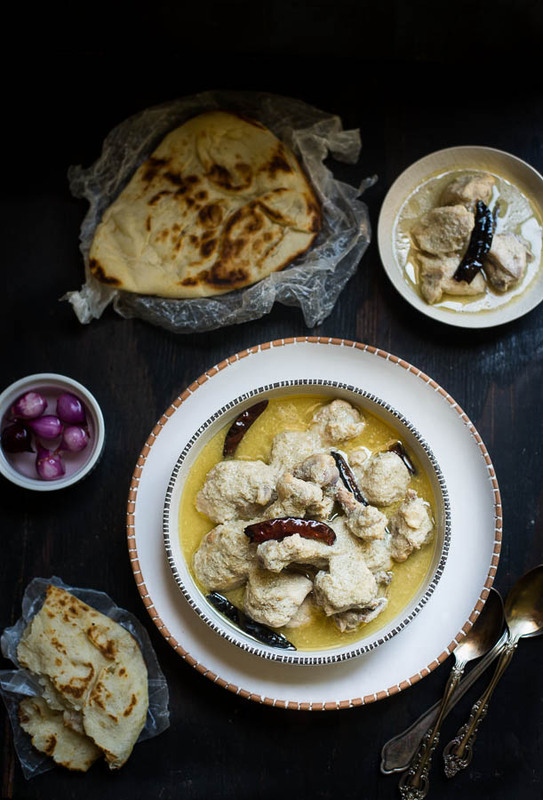 This silky-gravy chicken dish goes well with nan and parathas. Keora water : few drops. 1. Wash and pat dry chicken pieces with kitchen towel. Add 1/2 of the onion paste, 1 teaspoon ginger paste, 1 tablespoon garlic paste ( fine paste ) and 3 tablespoons of beaten yogurt to chicken. Mix it well. Add white pepper powder, nutmeg powder and salt to it. Marinate the chicken for about 2 to 3 hours. 2. Soak the cashew and poppy seeds and make a smooth paste. 3. Take a non-stick pan, and add oil and ghee and heat it up. Lightly pound the whole spices ( cardamoms, cinnamon stick, cloves, mace ) and add it to the pan. Add red chilies. 4. Once aroma comes up, add the remaining onion paste. Stir it for couple of minutes. Then add the remaining ginger and garlic paste. Cook it until raw smell goes off. But don't make it brown. 5. Add 2 tablespoons of cashew - poppy seeds paste to it and keep stirring. Lower the flame. Add half teaspoon of sugar to the remaining yogurt and whisk it. Add the yogurt mixture to the pan. Cook for couple of minutes. 6. Add the marinated chicken to the pan. Stir and cook it for 8 to 10 minutes on medium heat. Add 3/4 cup of warm water, add salt and cover the pan. Let it simmer on low heat until oil starts to float on the top and chicken pieces are fully cooked. 7. Check seasoning, add salt and white pepper powder if needed. Add Keora water and mix it well. Switch off the gas and serve hot with Naan or any kind of Paratha or Indian Flat Breads. ** This recipe works well with Paneer, eggs and some vegetables like cauliflowers.